I do have a lot of fun with the Year of Letters. 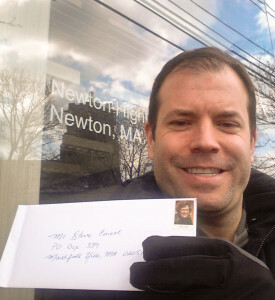 Here’s a shot of me mailing a letter to Steve Carell from his hometown of Newton, MA on Day 7. There are two things that are becoming very clear through doing the Year of Letters. The first is that if you are already pretty busy with work and you are writing a book, doing a blog that also involves writing is probably a terrible idea. My work on the book has definitely suffered from this project. It’s odd too, because I thought it would actually help me think creatively every day and sit me down to write. I envisioned that it would take me 20-30 minutes every day to write the letter, take a quick photo and post everything, but you can probably double that time at a minimum. Maybe I’m just slow and inefficient. It often takes up to two hours to do everything involved with writing the letter and posting it online. I’m not complaining, just telling you how it is. The other thing I learned is that something is really messed up down at the Post Office. Most of my letters go to places within the United States and I would estimate that the average letter takes one week to arrive. That in and of itself seems higher than I would have imagined. And on top of that some letters have taken nearly a month. Ironically a letter I sent to Finland arrived within a week – they seem to know what they are doing over there. Last week I received an undeliverable letter. It was a letter I sent on January 24th! It took nearly 3 months to be sent back to me. It was a letter to the manager at a FedEx Office in Ft. Lauderdale, FL – telling him how impressed I was with one of his employees. I know FedEx is a competitor to the USPS but come on, deliver their mail for crying out loud. Anyway, as luck has it, I will be back in Ft. Lauderdale this week and my hotel happens to be across the street from this very FedEx location, so I will go hand deliver it myself. Ms. Postmaster, please be on the look out for my invoice to you for the delivery charges that I am incurring to deliver this letter on your behalf. Stay tuned this week to hear what happens. This entry was posted in Sunday Letters, Sunday Notes and tagged blogging, FedEx, Ft. Lauderdale, handwritten letters, mail, snail mail, the Post Office, USPS, writing, Year of Letters. Bookmark the permalink.